We equip you with the skills necessary to live a self-sufficient lifestyle: permaculture, herbal medicine, homesteading, planning & more. You have a dream - Grow your own food. Fresh eggs. Clean, country air. Take charge of your health. Become more self-sufficient. It's an exciting dream and we're right there with you! But, where do you start? How do you plan a garden or orchard? Should you get animals? If so, which ones? How do you know you're not making an expensive mistake? Those are great questions and that's why we built The Prepared Homestead Courses. Our courses are designed to assist you as you make the transition to self-sufficiency whether you have acreage or a small lot. In 2012 we began to really prepare for Sean's retirement from the Marine Corps. For years we had been studying subjects related to self-sufficiency - herbal medicine, permaculture, gardening, off-grid systems, water catchment, pond building, animal husbandry and more, but we really amped things up at this point. In May of 2014 we finally bought our 40 acre homestead and put all our knowledge into practice. Frankly, we jumped in with both feet we: planted an edible forest garden, created pastures, got goats, sheep, rabbits, chickens (meat and laying), turkeys, ducks, & pigs. Through our experimentations, successes, trials, and mistakes - WE LEARNED. Once we bought our place, we had even more questions that we didn't realize we'd have. We spent HOURS scouring the web, frustrated. We struggled finding reliable, knowledgeable instructors who could help us with more than just one subject. YouTube was helpful for a quick search on a specific subject, but lacked in giving us an all-around look at everything a homesteader would need to know and do. We ended up just stepping out and doing things even if we weren't 100% sure how. Many of those decisions turned out great, or we just needed to make small tweaks. Some of them were a lot more problematic and required a complete do-over. That not only put us back financially, but also time-wise. We realized there was an educational gap out there and we needed to fill it. Both of us have taught and mentored people throughout our lives so this was a very natural move. We spent the first two years writing a blog (including on Mother Earth News), podcasting, teaching in-person workshops and courses as well as offering apprenticeships. The problem was that many people weren't able to make it to our homestead and we realized that the content we were putting on the web wasn't organized into categories making it easy for people to really get going. So we decided to start a membership and online courses allowing people to really get valuable information and find what they need. During the last 4 years Sean & I have also been consulting with other homesteaders and small property owners helping them achieve their dreams: designing and, in some cases, implementing the plans. Sean has also helped clients choose the right property for their goals and dreams, many of these clients were referred to him by local realtors who recognize his expertise (and several have come to our workshops and classes). These fellow-homesteaders have seen huge successes which we love to see and hear about! We want the same for you! Once a month we hold a one hour, live video call with all our TPH Crew Members giving them a time to bring their problems, questions, and successes to us. We come prepared to give specific advice and casual consultation. We are fully committed to giving you the education & training you need to move past any mental blocks or educational deficiencies you may have. You want to achieve your goals as quickly as possible with as few mistakes as possible, right? What Are Other Homesteaders Saying? "As I approach my 1st year anniversary homesteading and am witnessing daily not only the fruits of my labor but a fulfillment of the intelligent analysis and planning report you prepared at the onset of this endeavor. I would be remiss not to acknowledge the tremendous value, insight, focus and practical know-how you brought to bear on my property through your consulting services. From your ( and Monica's) informative, honest, entertaining and "real" podcasts to the no-nonsense, exceedingly practical, friendly homestead workshops, you and your family are truly a "one-stop" shop for all things homesteading. You folks clearly walk the talk as evidenced by your beautifully functional homestead! Your true to form and functional homesteading lifestyle combined with your integrity, work ethic, business expertise and superb analytical skills made the decision to hire you one of the wisest things I've done thus far! Thank you very much!" "I attended the "Introduction to Homesteading" Workshop offered by The Prepared Homestead and received much more information and knowledge than I could have ever imagined. In short, I am extremely thankful that I attended the workshop, and HIGHLY recommend this and other workshops to ANYONE who is thinking about or wants to receive knowledge in an understandable and concise format on Homesteading, Permaculture, livestock, Food Forests, and Food Preservation. The plethora of information will provide you with tools and motivation to actually get started. I believe, like me, you will leave inspired, motivated and confident that you can enact your plans into real life. "The Mitzels are a fount of knowledge. We greatly benefitted from the information they imparted. We highly recommend them." Sean and Monica came out and consulted on my acreage. What I got was a far more thorough knowledge of my property and its capabilities along with a step-by-step guide to take me from where I was at to where we want to be. Everything from the pH of my soil to the type of trees and drainage paths….SO worth it!! Sean and Monica Mitzel consulted for us last fall when we bought our property and I can say that it helped us immensely! They came and checked out our property, took pictures, talked to us about our goals and expectations as well as other things. After a few days, we did a phone consultation alongside a power point presentation on what was recommended. We have followed through with as much as we have been able to so far and it has been very useful information. I HIGHLY recommend their services! You did a fabulous job on the Intro to Canning Workshop. Now I am ready to start canning. Thank you for the hands-on, which really makes a great impact for confidence, and the concise instructions in the class and to take home. I believe we will all be successful at canning, which will be a great addition to the food, including storage, for our families; not to mention great gifts." Get started today working toward your dream, let us help you get there! Sean earned his Master's in Business as well as Military Studies before he studied to become a Permaculture Designer and retiring from the Marine Corps after 24 years of service. He decided to put his knowledge & experience to work by teaching, consulting, & speaking on Planning (personal and homesteading), Project Management, Homesteading Skills, Permaculture, Preparedness, & Protection (Personal, Home & Family). He has a passion for helping people achieve their dreams and he knows how to help them get there! He spends his days walking his property, observing his land, propagating plants (he's an addict), planting trees, reading, writing his book, creating online courses, raising animals, teaching, speaking, consulting with clients and most importantly enjoying his family. He is also a Master Gardener and Master Forest Steward and continues to pursue more education in Project Management, Advanced Permaculture Design & Agroforestry. Ryan Herring is a Mechanical/Plumbing piping designer for L&S Engineering. He worked for an indoor hydroponic cannabis farm where he diagnosed plant health and made nutrients and specialty microbial teas and ferments for about 9months. He graduated the Spokane Master Composter program in 2013 and graduated from the WSU Master Gardener program in 2014. In 2015 he continued his journey and obtained a Permaculture Design Certificate from Skeeter Pilarski and the Inland Northwest Permaculture Guild. He continues to be an active member of the Inland Northwest Permaculture Guild and has been teaching Soils and Regenerative Agriculture/gardening to the local community. Ryan has been active member in the regional Inland Northwest Biodynamic Group since the fall of 2014. 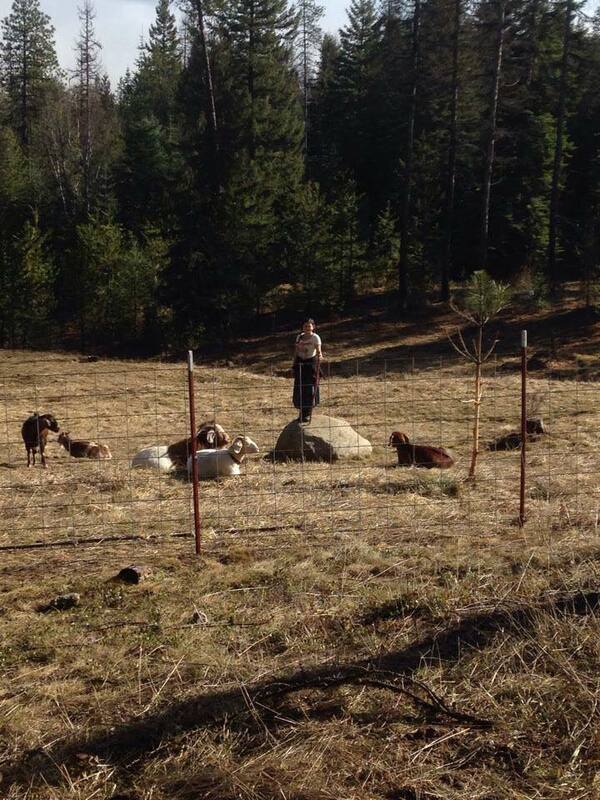 He practices and consults on Biodynamic farming and gardening in the Inland Northwest. Most recently he joined the Fellowship of Prep Makers and the Evaluation Group that works with the BD Association to define qualitative standards for soils, composts, foods and preparations. In his free time he enjoys spending time with his family of six.